Phishing through a popular Android App is a unknown phenomenon upto now but Trend Micro today reported that they have discovered a vulnerability that affects older versions of the Spotify App for Android. Trend reported that only older version including Spotify 1.1.1 are affected by this vulnerability. If you have a Spotify App version 1.1.1 and below, you did better upgrade it now! Trend has reported that the vulnerability, which can be exploited by a cyber criminal and can allow him/her to control what is being displayed on the Spotify App interface. By using this flaw to control what appears on the victims smartphone or tablet can be abused by cybercriminals to launch phishing attacks that may result to data loss or theft. Trend informed Spotify about the vulnerability and Spotify immediately fixed the flaw and released a upgrade for the App. Therefore if you are using Spotify kindly upgrade it by visiting it at Google Play here. Trend has reported that the vulnerability affects a specific activity (com.spotify.mobile.android.ui.activity.TosTextActivity), which is designed to retrieve and show Spotify web pages on the App UI. 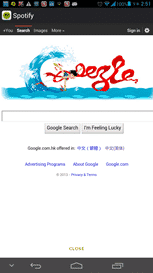 The vulnerability causes the content of these exported web pages to be visible to other apps installed in the phone. Furthermore, the bug can allow a separate App, process, or thread to trigger the activity without the need for additional permissions. Using a malicious app, an attacker can exploit this activity to alter the content being shown by the App to users. 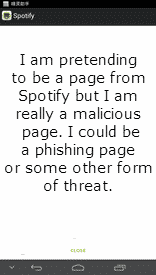 Spotify was able to show the harmless Google homepage on the Spotify App but a cyber criminal with a sinister intent can use it to fake your banks home page to gain confidential information. Trend Micro has also reported that the malicious App can trigger and “minimize” the activity at will of the attacker. If a user tries to stop the Spotify app by using the “Back” button, the malicious content will show up on the screen. Users who may not be overly familiar with the App might view this action as a normal routine for the App and click it. Because potential attacks do not require additional permissions, users may not be aware of any suspicious activity that may arise from this situation. No additional permissions also mean that the Anti Virus App on your Android smartphone / tablet cannot detect and analyze malicious activity going on in the background.